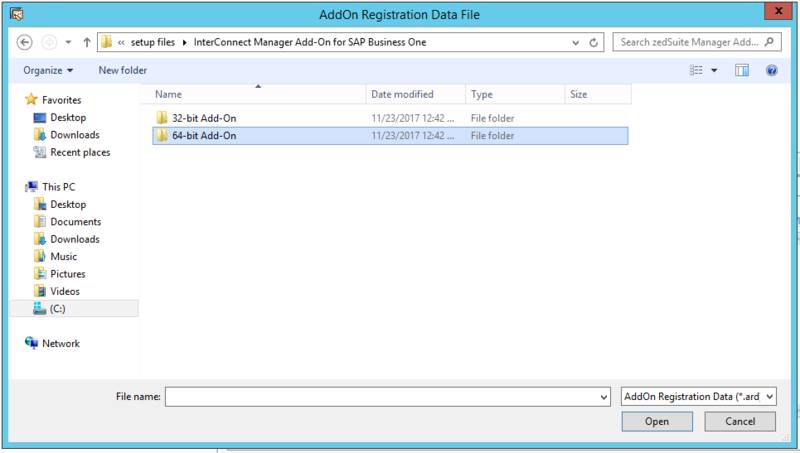 InterConnect Manager Add-On for SAP Business One is an administrative tool used in the configuration of all Portal products. It's used to manage details such as user settings, menus, roles, and web configuration. 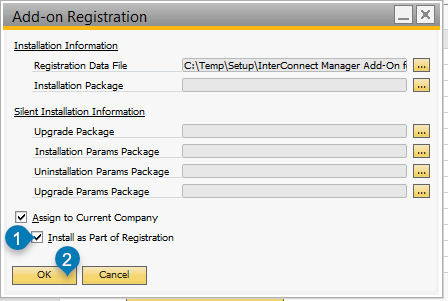 A license is required to run InterConnect Manager Add-On. Review the walkthrough Applying Product Licenses. Warning: An upgrade will destroy Customer Portal payment gateway information. If performing an upgrade from before version 7, first take a screenshot of all Customer Portal payment gateway information. See Version 6.1 - Customer Portal Configuration Settings - Payments tab for details on how to get the old payment information. Before Performing an upgrade, review Preparing for an Upgrade. Follow any upgrade-specific backup tasks (such as backing up Customer Portal payment gateway information), then uninstall the old version and proceed as per the installation instructions below. Determine which bit-levels of SAP Business One will be used. Users may use the 32-bit client, the 64-bit client, or both. 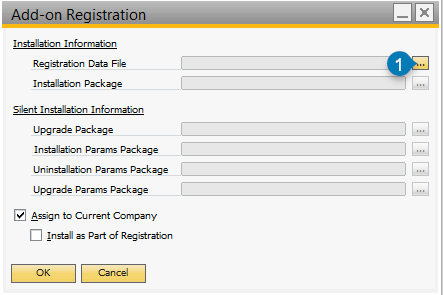 Register all versions that may be used by SAP Business One end-users. 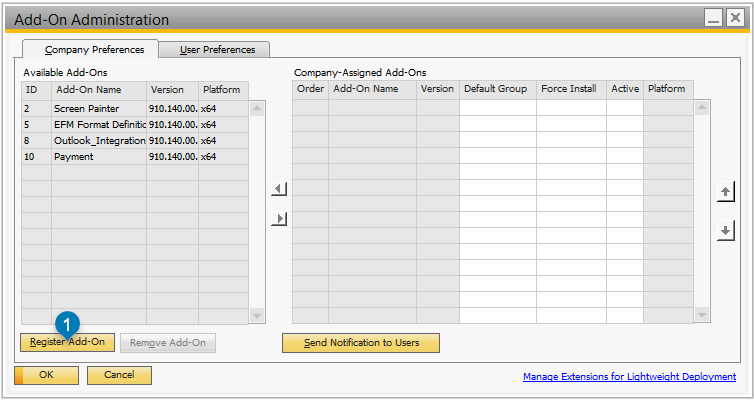 Open the Add-On Administration screen in SAP Business One. To do this, go to Administration > Add-Ons > Add-On Administration. Select Administration - Add-Ons - Add-on Administration. Press the Register Add-On button (marker 1 below) to continue. Add-On Administration is used to register InterConnect Manager Add-On within SAP Business One. Press Register Add-On (1) to proceed. From the Register Add-On dialogue, press the … button (marker 1 below). Use the Register Data File field (1) to open the file dialogue. Select the file /Setup Files/InterConnect Manager Add-On for SAP Business One/64-bit Add-On/InterConnect Manager AddOn_64.ard. First, open the InterConnect Manager AddOn 64-bit Add-On folder. Second, select the file InterConnect Manager AddOn_64.ard then press Open to select the 64-bit version. If you are logged on to the 64-bit client, also select Install as part of Registration (marker 1 below). If you are logged into the 32-bit client, simply register but do not install the 64-bit add-on. This will allow 64-bit clients to run the add-on. After selecting the ard file, if appropriate, enable the Install as Part of Registration check-box (1) and press OK (2) to apply the settings. 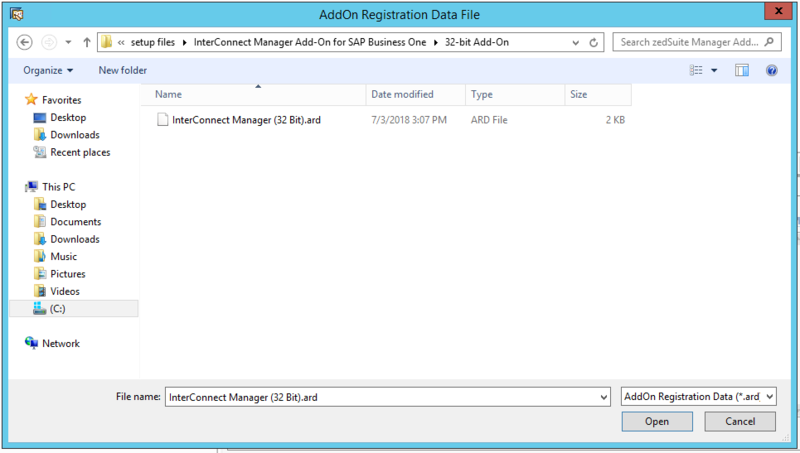 Select the file /Setup Files/InterConnect Manager Add-On for SAP Business One/32-bit Add-On/InterConnect Manager AddOn.ard. First, open the InterConnect Manager AddOn 32-bit Add-On folder. Second, select the file InterConnect Manager AddOn.ard then press Open to select the 32-bit version. If you are logged on to the 32-bit client, also select Install as part of Registration (marker 1 below). If you are logged into the 64-bit client, simply register but do not install the 32-bit add-on. This will allow 32-bit clients to run the add-on. If installing the add-on as part of registration, confirm the add-on installer displays, and follow the prompts to complete installation. 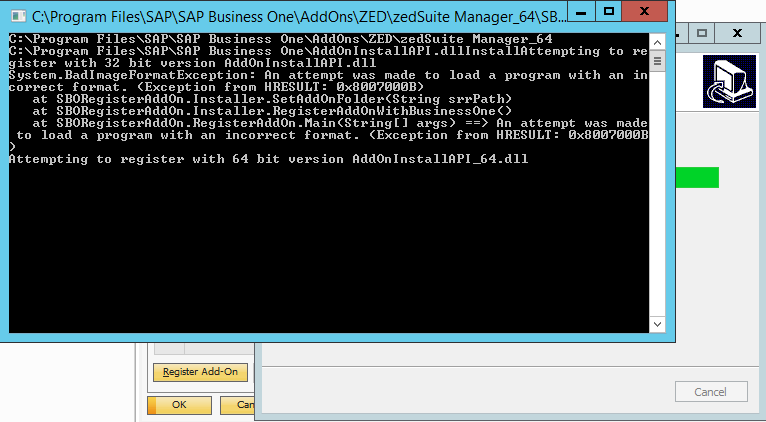 If you get the error “Add-on did not install correctly” or a similar message, close SAP Business One and make sure to run B1 using “Run As Admin…”. Press Next to proceed with installation. Wait for the installer to finish. When complete, the installer will automatically close. Default Group should be set to Manual (see marker 1 below). This allows B1 users to optionally load the add-on as needed. Automatic will load the add-on for every user, however most users are not Portal administrators and do not need this add-on. When the add-on is set to manual, individual users may be set to run the add-on automatically in the User Preferences tab. Force Install should be left un-checked. InterConnect Manager Add-On should be assigned to the Manual/Automatic Default Group (1) and set to Active. Press Update to complete the add-on installation. Press Register Add-On to register another file. 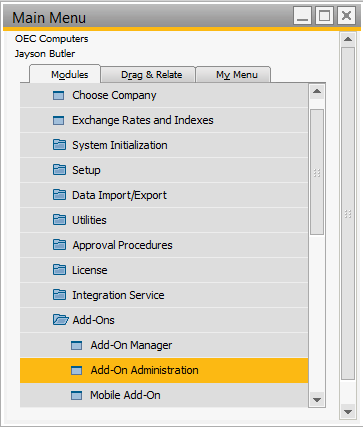 In SAP Business One, open Administration > Add-Ons > Add-On Manager. 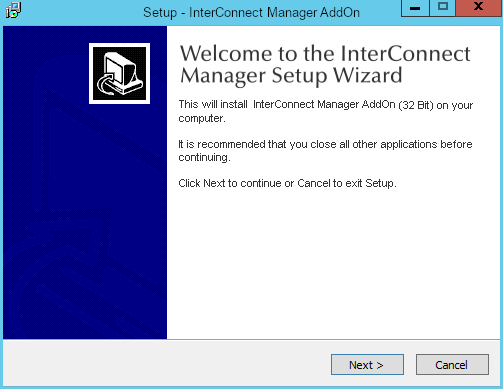 Select InterConnect Manager AddOn and press the Start button. 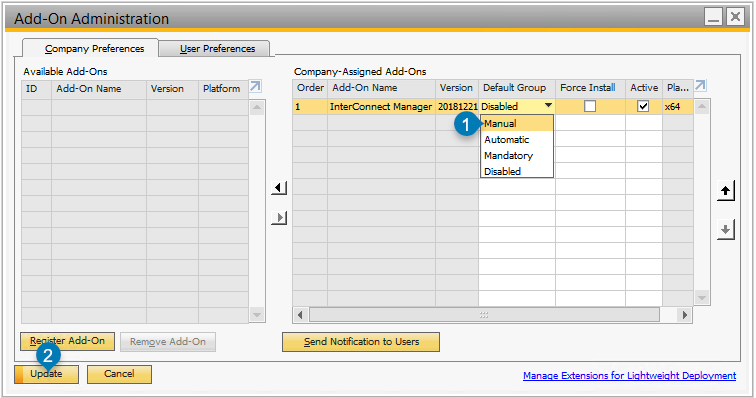 Wait a moment, and InterConnect Manager Add-On will appear as a menu option in the SAP Business One Main Menu. At this point, Portals can be installed (or upgraded) and configured.